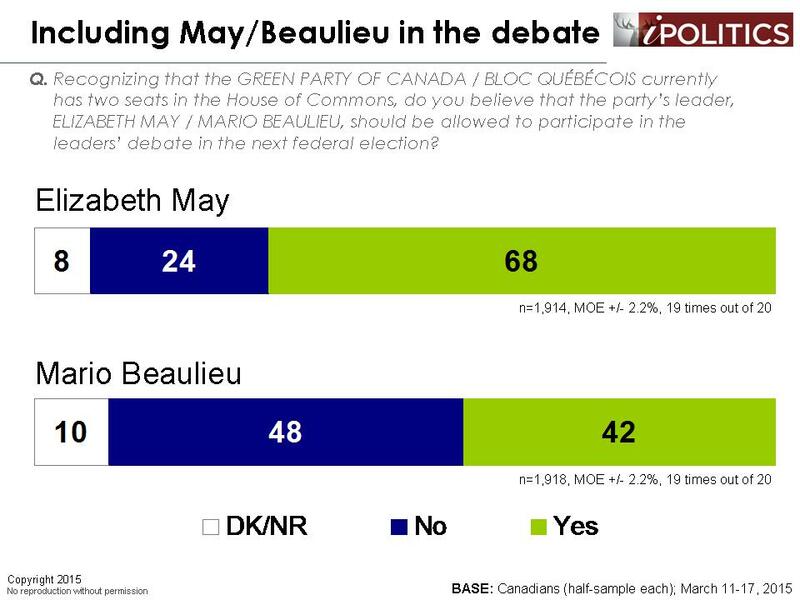 Do Voters Think Elizabeth May Should be Included in the Debate? [Ottawa – March 25, 2015] There are all sorts of procedural and strategic questions regarding who should participate in the leaders’ debates in the upcoming federal election campaign. The debates are by far the most watched spectacle of a campaign and the risks and opportunities are very high for the parties. In this article, we address the issue of whether or not members of the public think that Elizabeth May, leader of the Green Party, (and Mario Beaulieu, leader of the Bloc Québécois) should be allowed to participate. Ms. May was allowed into the 2008 debate when her party held a single seat in Parliament, but was barred from participating in the 2011 debate. This time, her party controls two seats, but she is tied with the Bloc Québécois and the newly-formed Forces et Démocratie and the network consortium that makes the final decision may not wish to “clutter” the debate room. Furthermore, the consortium has no clearly-defined rules as to who participates, so this issue is still very much up in the air. Here we will look at what the public thinks and offer up some other data on her status with voters in terms of approval and vote intention. Although we would not presume to advise the powers that be on this question, the public’s view is pretty clear. We would like to be clear that we are making no judgements as to whether Ms. May should be included in the debates. Instead, we are simply tackling this issue from the standpoint of public opinion. First off, let’s consider the size of her constituency at this time. Unlike 2011, where the Green Party faded from its 2008 performance of capturing 6.8% of the vote, the Green Party has done quite well in our recent polling of vote intention. The party consistently receives the support of eight to ten per cent of Canadians. An important caveat is in order here: Green Party support has traditionally been overstated in public opinion polls. This is largely because so much of their support (two-fifths, in fact) comes voters under the age of 35, a group that has routinely failed to actually show up to the ballot booth on Election Day. However, even assuming that Green Party support is overstated, projecting the results onto an eligible voter population of approximately 24 million translates to more than a million votes. Furthermore, the Green vote says it is more certain to vote than in the past. The next factor to consider is Ms. May’s approval rating. 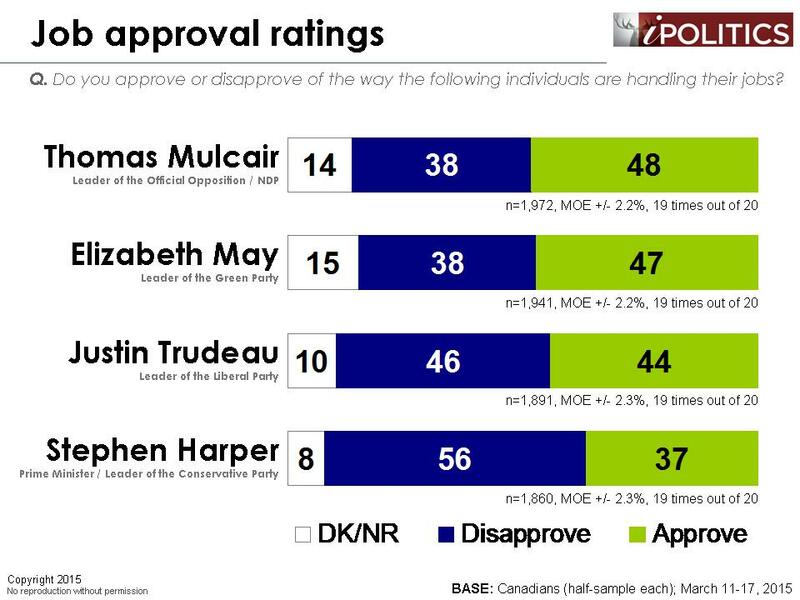 At 47 points, Ms. May is statistically tied with Thomas Mulcair for the title of Canada’s most respected leader. Regionally, she is well-liked in British Columbia, Ontario, and Atlantic Canada, although her standing in Quebec leaves something to be desired. Nevertheless, her Quebec-only approval ratings eclipse that of the Bloc Québécois leader, who is widely met with disapproval, among those who have even heard of him at all. She is well-respected within the Liberal and NDP constituencies, although Conservative and Bloc Québécois supporters hold a somewhat more disparaging view. 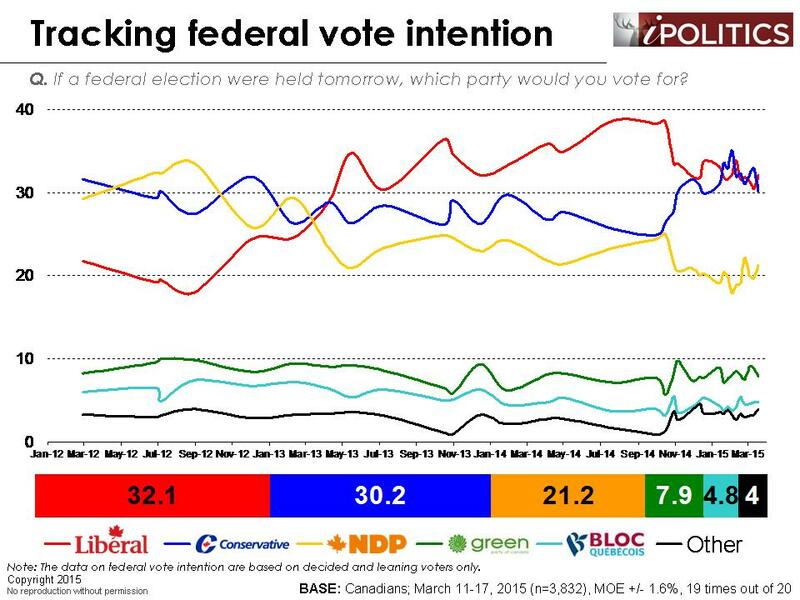 Our tracking reveals that for better or for worse, Elizabeth May is slowly becoming a household name. In 2009, one-third of Canadians did not feel able to express an opinion about Ms. May one way or another. Today, just 15 per cent are uncertain and her approval and disapproval ratings have both grown by similar margins. Finally, we recently asked Canadians whether they believe that the Elizabeth May should be allowed to participate in the leaders’ debate in the next federal election. By a margin of nearly three-to-one, (68 per cent to 24 per cent), Canadians feel she should be allowed in. What is perhaps most striking is that this view is shared by Canadians of every political stripe, with majorities of each party’s supporters backing May’s admission to the debate. These results contrast sharply with the Bloc Québécois which, despite holding the same number seats as the Green Party, would not be anywhere near as missed if their leader were barred from attending. Indeed, a plurality of respondents – 48 per cent – say Mario Beaulieu should not be allowed to attend. As we stressed at the beginning of this article, we make no attempt to judge the merits of allowing Elizabeth May to participate in the Leaders’ debate. However, the public says she should be allowed in and she carries strong support and she is seen as a strong leader. From a public opinion perspective, it is extremely clear that voters want Elizabeth May to have a seat at the table in the upcoming debates. 3 comments to Do Voters Think Elizabeth May Should be Included in the Debate? E May should be included in the 2015 election debates.